News ► New KINGDOM HEARTS 0.2 Scan in Jump! 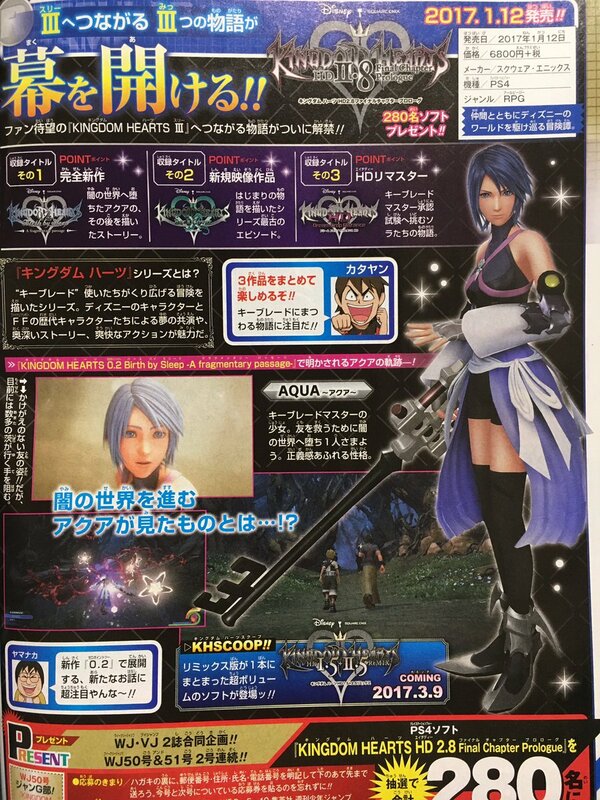 Jump has a small feature on KINGDOM HEARTS Birth by Sleep 0.2 -A fragmentary passage-, showing off Aqua's new model and some new screenshots. Loving the new Aqua model that's being used. And I find it intriguing that Ventus and Terra are being depicted in more than one scenario... really fits the psychological effects the Realm of Darkness has. Actually, that screenshot of Terra and Ven walking in the Dark Forest of Dwarf Woodlands (at least I assume it is Dwarf Woodlands, the trees look similar to those Ven protected Snow White from) has some eerie similarities to the scene in DDD where Sora is running after an illusory Riku and Kairi who then warp into Aqua and Terra. I feel like following these illusions of Ventus and Terra is what keeps Aqua going so I'm quite positive we'll encounter them in several locations. The game is looking so amazingly good, KH will save 2017. Well she makes it to the Dark Margin without seeming too emotionally ruined, does she not? If anything she was still clinging to hope when AtW talks about a Keyblade wielder who has been saving the worlds and immediately asked if they were Terra or Ven. I think Terra and Ven are meant to be her guides as she loses herself on her own. I love Aqua's new render here! I personally prefer it more than her CGI artwork. It's good to see Ven and Terra appearing in another location. I suppose that's true. She ends up safe in the end. I guess the key difference here is her chasing her pain/hurt isn't being orchestrated by some evil bald dude and is just general unharnessed darkness which she can handle. lol Ven, something is wrong with ur clothing. Aqua's new render is amazing. The graphics of the new engine for this series have really started to take shape into something visually stunning. It may be a parallel to Sora in DDD but with a different outcome. I'd say the key is more that Aqua is really "only" dealing with her own pain here and possibly Terra's/Ven's by proxy. Sora on the other hand had to deal with the combined pain of NaminÃ©, Xion, Roxas and Ventus (in the order they appeared in DDD) with only short pauses between it. Not to mention that all those people's hearts except NaminÃ©s also all reside directly in his own heart which probably increases the impact as well. Or maybe it represents how Ven has finally accepted both the light and darkness. His clothes before represented the divide between them, but the checkering could now show he is whole again? Or the dev team has been drinking. Or Nomura decided to change the design on a whim. my vote's for the former. I don't know why I'm just now thinking of this, but I'm getting a Yuna vibe from Aqua's clothes. Specifically a Songstress Yuna vibe. I'll settle with the explanation that it is just a graphical error for now. Haha. "Sorry Sora-sama, I woke up on the wrong side of the bed today. It has been a long night for me." Ngl, I saw this in the updates on the left and thought this was from the shipping thread.